(NewsUSA) - Sponsored News - In a world that thrives on bad news and sensationalized storytelling, it can be difficult to find programming consisting of genuine and authentic shows about family. Research suggests that 42 million adults are looking for programming with family in mind. Enter UP TV, a network whose mantra is We Get Family, and is staying true to its brand by ushering in shows that bring adult viewers all the fun, dysfunction and love that defines the modern American family. "With family as our framework, we are filling a void in the media landscape as the brand families trust most to bring them positive programming," said Charley Humbard, president and chief executive officer, UP. That is how UP is finding its niche with families -- through its brand. From shows about a single mom to parents with sextuplets to a family with 19 kids, UP is all about relatable and entertaining storytelling. "We believe family, whether through blood, friendship or community, provides us with the most emotional and memorable experiences in our lives. It's a journey with highs and lows and everything in between." No doubt, with an endless array of choices, it can be difficult to find good, authentic, entertaining stories that viewers can feel great about watching. UP seems to have found its footing through original programming such as Growing Up McGhee, Bringing Up Bates, and Jo Frost: Nanny On Tour, as well as syndicated series such as Parenthood, Gilmore Girls and America's Funniest Home Videos. And for those who are looking specifically for family and faith-affirming content, UP has a subscription-on-demand offering, UP Faith & Family. 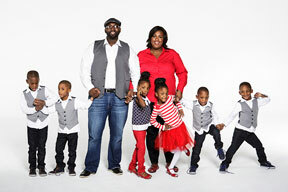 The McGhee family from "Growing Up McGhee." Series premieres Wed., June 8 at 9 p.m. ET.